Preheat oven to 375°F. Separate dough into 8 triangles. Place 1 teaspoon pesto on the wide side of each triangle. Top pesto with 1 marinated artichoke quarter. Roll up, starting at the wide side of triangle and rolling to opposite point. Place, point side up, on ungreased cookie sheet. Sprinkle with red pepper flakes. Bake at 375°F for 10 to 13 minutes or until golden brown. Cool 5 minutes before serving. 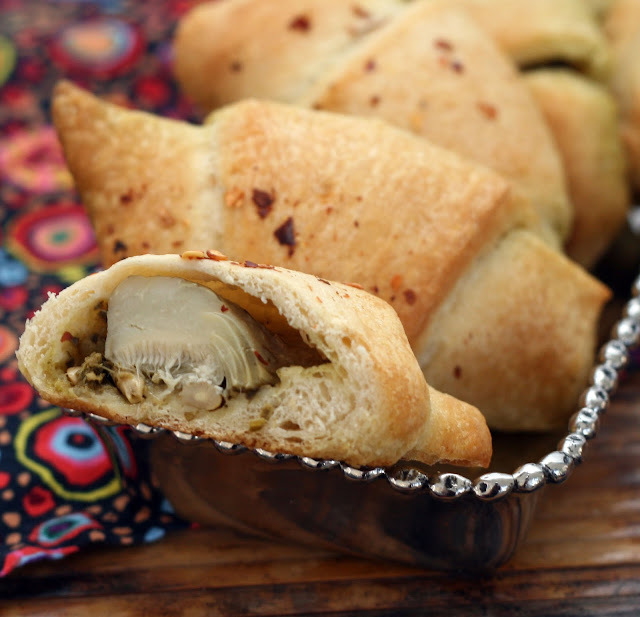 Pillsbury contacted a few bloggers about creating new quick and easy recipes for holiday entertaining using their crescent rolls. I don't think I've had a crescent roll in years but I'm always up for a challenge! I thought I'd give them a jolt by using boldly flavored ingredients. I love marinated artichoke hearts and had a really well spiced jar in the pantry (actually a bookcase in our basement, the marvels and limitations of old houses) that I paired with a garlicy pesto. You could make your own pesto or use a good quality store-bought version. I know our local Italian market always has a ton and buying it prepared makes this recipe a snap. To jazz the outside up a bit, I sprinkled some red pepper flakes on top. They also added a slight heat which I think worked really well. I think these would be the perfect last minute dish to bring to holiday dinner.